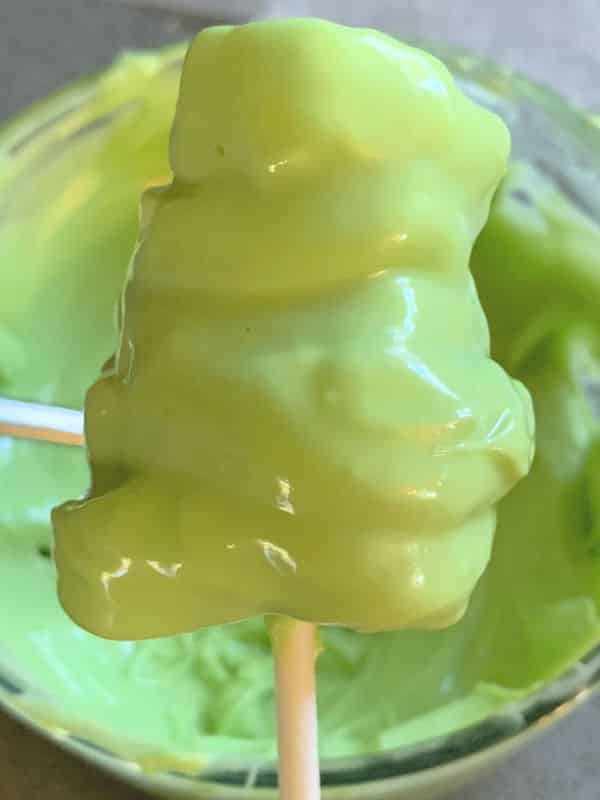 My kids love marshmallows and I love making fun holiday treats that are easy and cute. 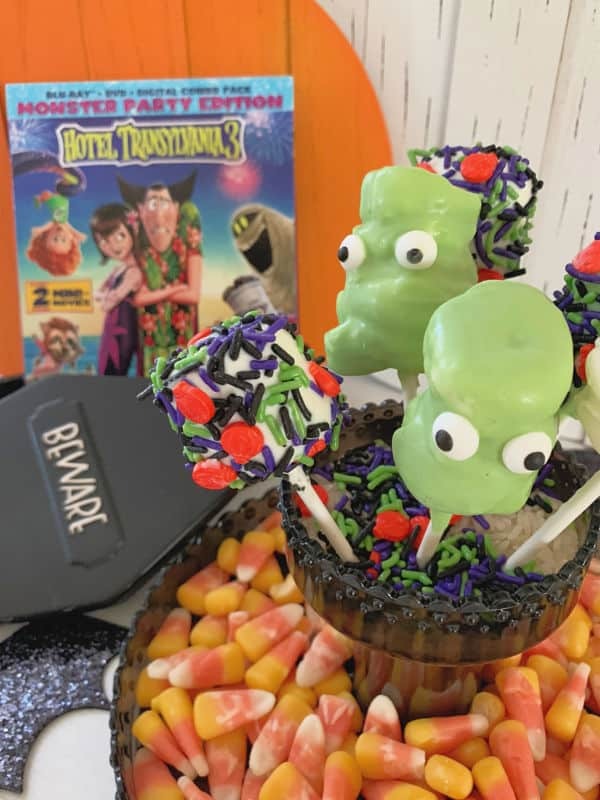 These Halloween marshmallows are the perfect way to get in the spooky spirit for a Hotel Transylvania 3 movie night! 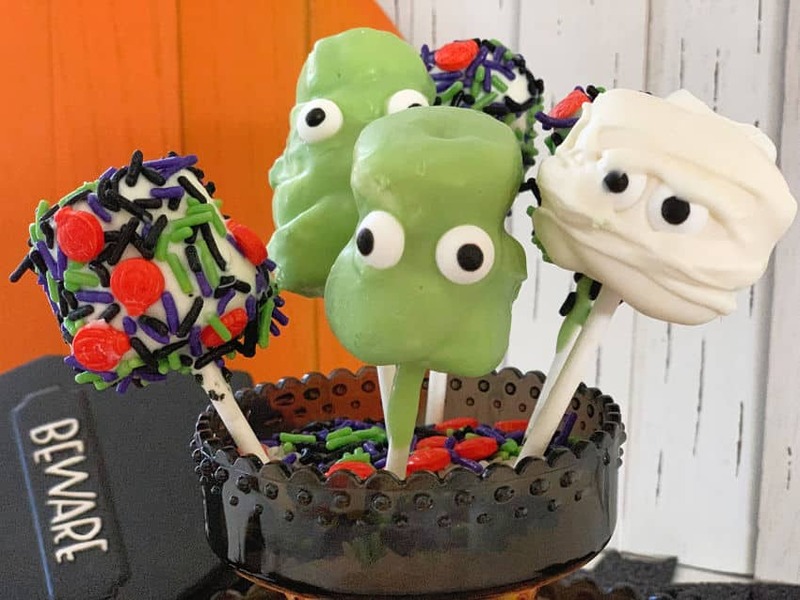 Make Blobby and Murray from Hotel Transylvania 3 for a tasty treat while you watch the movie. 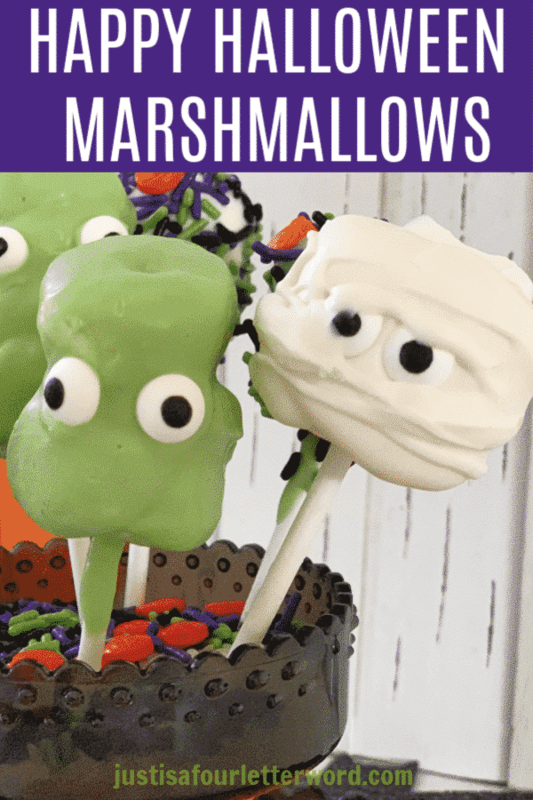 My Halloween marshmallows are easy and delicious. You can even make them with the kids. Add some candy eyes and sprinkles and everyone is happy. Once you have all the supplies, the process goes pretty quickly. Melting and stirring your candy melts is the most challenging as you’ll have to be patient. But your delicious prize is worth the wait! To create the lovable Blobby character, I used jumbo marshmallows and sliced them a few times to have thinner layers. I also shaved off a little around the sides so he is bigger at the bottom and smaller on top. 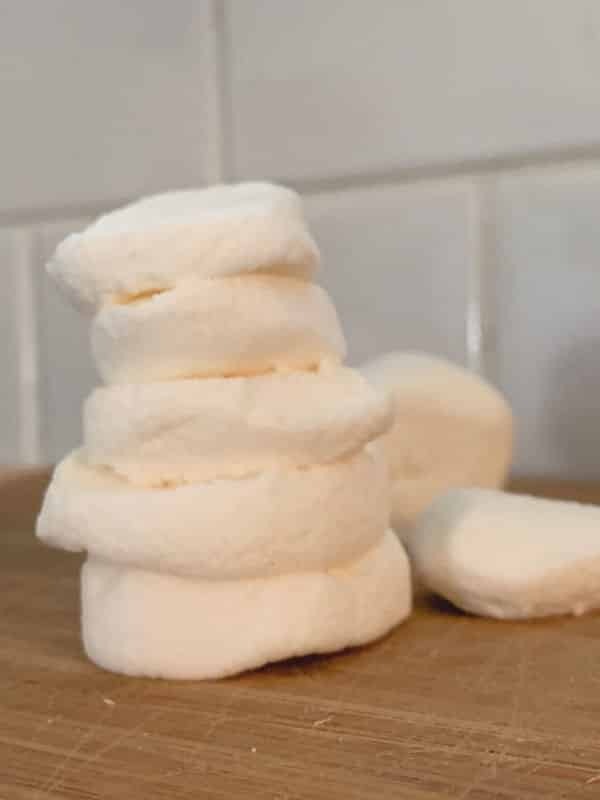 Sliced marshmallows are pretty sticky so you really don’t need anything else to keep them together. Once you have your Blobby shape, pierce a lollipop stick all the way through the stack, stopping just before you get through the top slice. 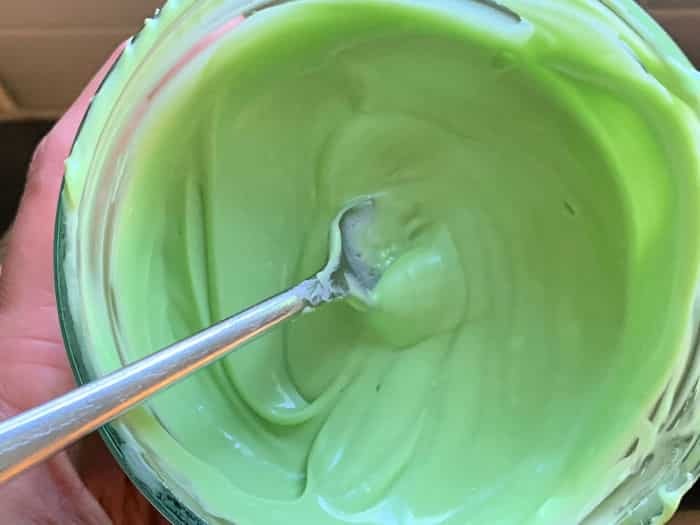 You’ll need to purchase green candy melts and follow the package instructions for melting. 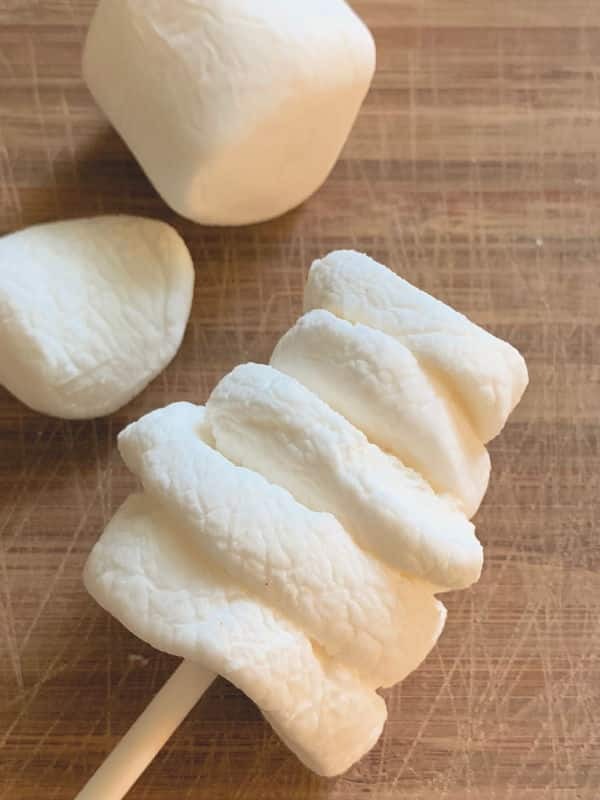 I like to melt a little at a time, stir in Crisco to thin if needed and make sure the marshmallows ready to go so I can dip them one right after the other. Dip your Halloween marshmallows and hold over the dip for a few moments to allow the candy to run off. You really want to get it in all the layers so you can see Blobby’s detail. 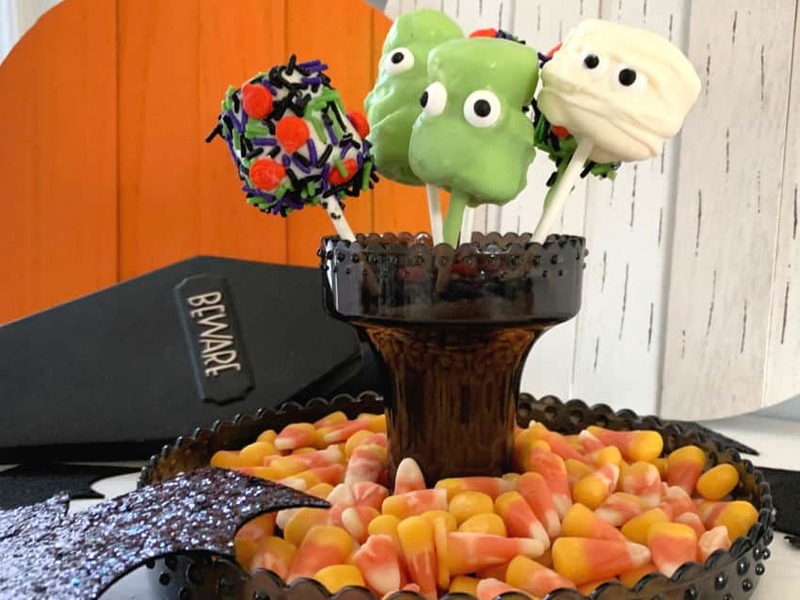 If it’s hard to cover the entire marshmallow, spoon some of the melted candy over the bare spots and let the excess drip off. Now comes the fun part, decorating! Blobby is so easy to make because all you need to do is add some candy eyes set a little wide. For the sprinkles, I just dipped one regular marshmallow pop and covered in sprinkles. To create Murray the Mummy, dip in white candy, add eyes and let set. Then, once the initial layer is hardened, drizzle more melted candy over his face to resemble the mummy fabric keeping him together. Now is the perfect time to plan a movie party just in time for Halloween. We love Drac and Mavis and all their friends and they’re back with a new adventure. Only this time, they’re at sea! 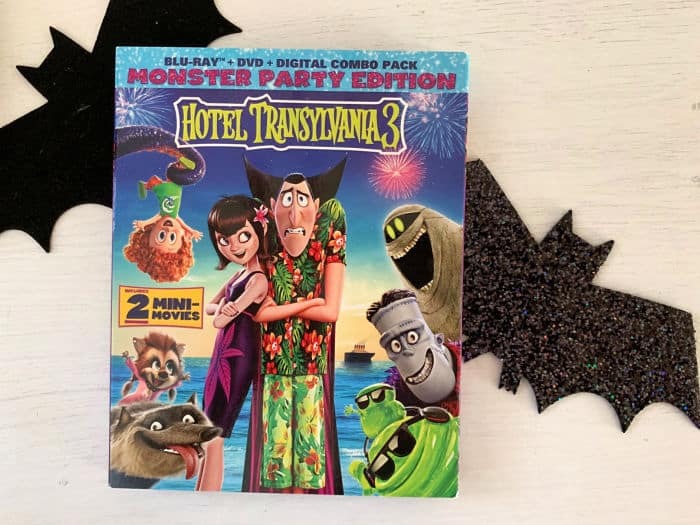 The Drac Pack is back with HOTEL TRANSYLVANIA 3, which follows in the tradition of the blockbuster Hotel Transylvania franchise when Mavis surprises Dracula with a family voyage on a luxury, haunted monster cruise ship. Of course, the rest of the Drac Pack has to tag along, and that’s when things get a little…batty. The monsters are having a great time, indulging in all of the shipboard fun the cruise has to offer, from monster volleyball to colossus-sized buffets and exotic excursions, but then the unexpected happens when Drac falls for the ship’s mysterious (and dangerous) human captain Ericka. The third film in this family-friendly monster franchise is the best reviewed installment and you’re invited along on the haunted cruise vacation! Hotel Transylvania 3 is now available on Digital and was released on 4K, Blu-ray, and DVD on October 9th. Grab a copy to enjoy this fun family movie and check out all the awesome bonus features! It really doesn’t take much effort to bring some ZING to your next movie night! Happy haunting! Want more for Halloween? Check out these paper pumpkin crafts or my Mickey Mouse Pumpkin cookies!